The classic 1 inch aluminum mini blinds are perfect for homes, offices, and any window with a small frame. They also work well covering windows built into doors. Featuring a durable and reinforced head rail along with high-quality aluminum slats. These 1 inch mini blinds are available in light alabaster and white. If you are looking for a one inch mini blind with more color options, you need to view our embassy mini blinds online. Similar to all of our products, free samples are available. These 1 inch aluminum mini blinds are made within five days leading to a quick turn-around time. It is also incredible easy to install and instructions are included. 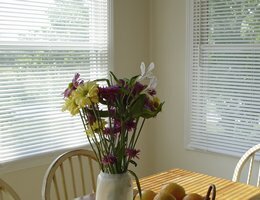 Our Classic 1 Inch Mini blinds are an easy and affordable way to customize your windows. Aluminum mini blinds offer a simple, yet traditional, window covering that is perfect for home or office use. Order today and enjoy this great looking mini blind! W: 23" 24" 25" 26" 27" 28" 29" 30" 31" 32" 33" 34" 35" 36" 37" 38" 39" 40" 41" 42" 43" 44" 45" 46" 47" 48" 49" 50" 51" 52" 53" 54" 55" 56" 57" 58" 59" 60" 61" 62" 63" 64" 65" 66" 67" 68" 69" 70" 71" 72" 0/0"1/8"1/4"3/8"1/2"5/8"3/4"7/8" H: 24" 25" 26" 27" 28" 29" 30" 31" 32" 33" 34" 35" 36" 37" 38" 39" 40" 41" 42" 43" 44" 45" 46" 47" 48" 49" 50" 51" 52" 53" 54" 55" 56" 57" 58" 59" 60" 61" 62" 63" 64" 65" 66" 67" 68" 69" 70" 71" 72" 0/0"1/8"1/4"3/8"1/2"5/8"3/4"7/8"
Are your mini blinds available with box end brackets? The mini blinds come with box end brackets as long as you do not select the integrated deco. We can also get a hidden bracket that clips into the top of the headrail if needed. Can your blinds be mounted on the outside of the window? Does the appropriate hardware for this come with them? Yes, our products can be installed either outside or inside mount. The appropriate hardware does come with each blind. Just specify which way you are going to be installing so that the appropriate hardware is received. I am looking for aluminum mini blinds that don't off gas, don't contain PVC, and are not treated with chemicals. Can you tell me what materials are used in your blinds (particularly if there is PVC) in the slats, wands, trim, and smaller pieces? These mini blinds are made from aluminum slats, a metal headrail. The cords are made from polyester. The only visible PVC would be the tassels and the wand tilt control. There are a few PVC parts within the headrail but the majority of the components are metal. Good quality, easy to measure and purchase. Good quality, easy to measure and purchase. Looks great in the window. We have rental properties and the classic 1" white aluminum mini blinds are our go-to blind to give our tenants privacy and darken rooms. We have rental properties and the classic 1" white aluminum mini blinds are our go-to blind to give our tenants privacy and darken rooms. They do a great job of keeping the hot summer sun out of the home when closed all the way. They do keep the rooms much cooler in the summer. Fit perfectly and were received quickly. Fit perfectly and were received quickly. Price a bit high, but they look really nice.